APPLE's Airpods have brought completely wireless headphones into the mainstream and the outlook is good, even at these early stages. Because competition is coming for Cupertino. 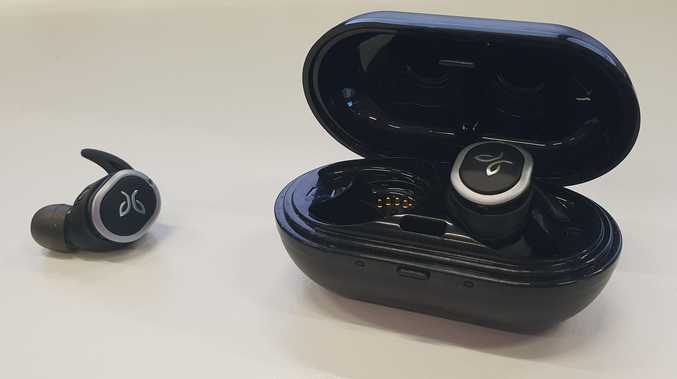 Jaybird's Run headphones are two units, one for each ear, that connect to your phone wirelessly, with some limited controls being built into each bud. Even without any kind of headset or cables to keep them in it can be pretty hard to dislodge them once properly fitted, even with headache-inducing shaking. And that's fantastic because they're built for runners and active types who want a subtle but capable way of staying in touch while exercising. The unboxing gives away the premium nature of the gadget, with a carry case similar to Apple's that charges the units while they're inside - we tested these for a week and only needed to charge the case once despite heavy use. Before you head out for your first run, you'll need to make sure the earbuds fit, so sit down with the various-sized caps and ear braces and see which combination feels most comfortable for you. Keep in mind that your ears might not need the same size in each side, and you'll see a dramatic improvement in how much you enjoy these headphones. Now that you're out in the fresh air, you'll notice how decent the audio quality is. They're not a pair of Planars or even Sony 1000X M3s, but for the price point and form factor you'll be treated to Jaybird's gorgeous-sounding and customisable sound quality. Again, the fit of the units makes a huge difference to sound quality so taker the time to get that right. The only real let-downs come from the controls and the battery life, the former being annoying and the latter understandable. At the time of reviewing there was no way to have both track and volume controls active on the units at the same time. This should be fine for runners who just want to run through their playlist from go to woe without much skipping or on predictably quiet runs, but for urban hikers and commuters, the price point calls for much better. The battery life is somewhat constricted, with fewer than a handful of hours (3-4 in hour experience) of use at decent volumes, but you won't be running that long and where were they going to put a bigger battery? Well, they put it in the carry case itself, which has another 2 or 3 charges in it anyway. One caveat with the case is that if it's knocked open in your bag while they're in there, the earbuds can try to connect to your phone, which (only once) interrupted another Bluetooth headset we were using at the time. These are a good pair of earphones, but they feel like they're a first-try by a talented newbie more than a sophisticated product from an established master. For that, you'll need the Jaybird's other offering, the Tarah Pro. And that's the point of this review: Unless you're an Apple-hater who absolutely needs to be rid of all cables, the Tarah Pros are a better option. Jaybird Run True Wireless Sport In-Ear Headphones are available now and are priced at $249 JB Hi-Fi.